I LOVE stuffed peppers! I really do! Growing up I always looked forward to the nights we had them for dinner. However, I have to confess that I have not made them as an adult. But, the other day when I was making up my weekly menu I thought stuffed peppers, YES, I want stuffed peppers. I, of course, called my dad and asked him how he made his. Then, I got online and did a little research of my own. The one thing I found is that either people were simply using ketchup or pouring a can of tomato soup over them. Now, both of those options are fine, but I just wanted more so I decided to head into my kitchen and experiment with some flavors. What I ended up with is some of the most flavorful stuffed peppers I have ever eaten! I KNOW you are going to love them So let's get started! Then, bring 2 cups of water to a boil. Add the rice to the boiling water, cover, and simmer for 15 minutes until done. While the rice is cooking you can combine the ketchup, sirracha, basil, oregano, a splash of Worcestershire. The reason I used ketchup instead of tomato soup or sauce here is because of all of the flavor and seasonings the ketchup already has is in. It would take way to much time to recreate that from scratch, so when you can cut those flavor corners, do it! Add the chicken stock (or in my case water and Chicken bouillon). Whisk everything together and set to the side. Now it is time to focus on the meat mixture. In a mixing bowl combine the ground beef, onion, garlic, bread crumbs, milk, egg, salt, and pepper. Using a rubber spatula, mix the rice into the meat mixture. For the peppers, cut them in half from top to bottom. Remove all of the seeds and ribs. Rinse well and salt the inside. Finally we can start baking! In your baking dish, spread a think layer of sauce in the bottom of the pan. Using an ice cream scoop, fill the pepper halves with the meat mixture. Then pour the remaining sauce over them. After 1 hour, remove from the oven and let the peppers set for 10 minutes. The meat in these peppers is light and fluffy. The sauce, OH MAN, so bold and zesty with the perfect sweet balance. This ain't yo momma's stuffed peppers FO SHO! 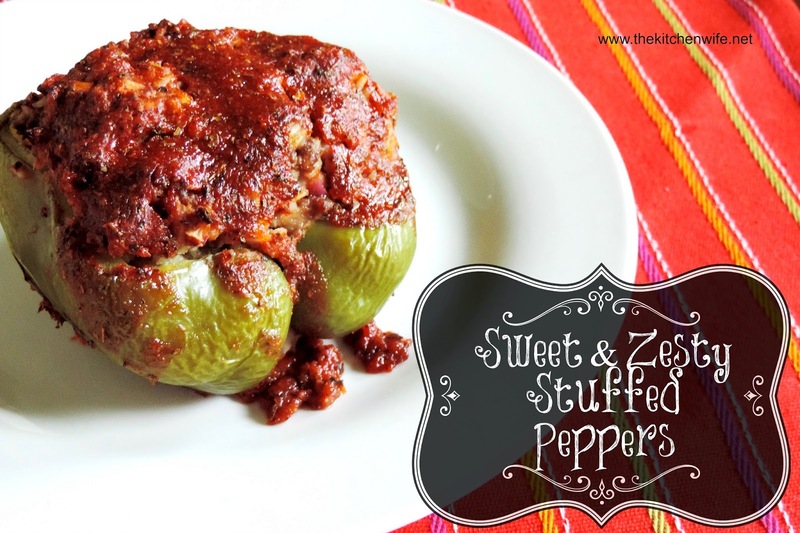 If your family liked your stuffed peppers before, they will love them now! And if you have never tried stuffed peppers in the past, get ready for a new family favorite! These will not disappoint! In a pot, add 1 c. of rice to 2 c. of boiling water. Lower to a simmer and cook for 15 minutes. While rice is cooking add the ground beef, onion garlic, Worcestershire sauce, bread crumbs, eggs, milk, and salt and pepper to a large mixing bowl. When rice has finished cooking, drain and add to the meat mixture. With a rubber spatula, mix all of the ingredients together until well incorporated. For the sauce add the ketchup, water, basil, oregano, brown sugar, and sirracha to a mixing bowl. Whisk the sauce mixture together and set aside. For the pepper, slice them in half from top to bottom, pull out the seeds and ribs, and rinse. In a baking dish place a thin layer of the sauce on the bottom. Lay the peppers in the baking dish, cut side up. With an ice cream scoop, stuff each pepper with the meat mixture. Cove the stuffed pepper with the remaining sauce. Bake in a 350 degree oven for 1 hour.